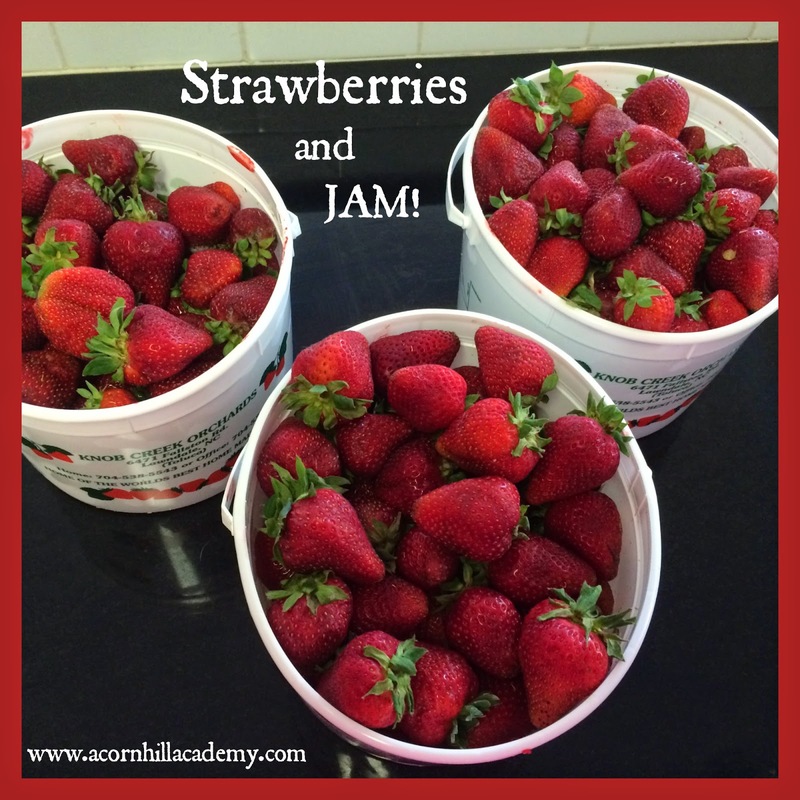 Acorn Hill Academy: Strawberries and Jam! I love strawberry season! I love to pick berries, although I haven't had time this year. A friend of mine brought us a bunch, though, so we ate lots and made JAM! Now, I'm a fan of strawberry freezer jam. My Grandma Rosen made strawberry freezer jam and put it in little butter tubs. I could eat it by the spoonful! We did make some freezer jam this time, too, but the majority was cooked jam. I wasn't sure I had space in the freezer for a lot of jam, and this way I can give it away as gifts if the occasion arises. 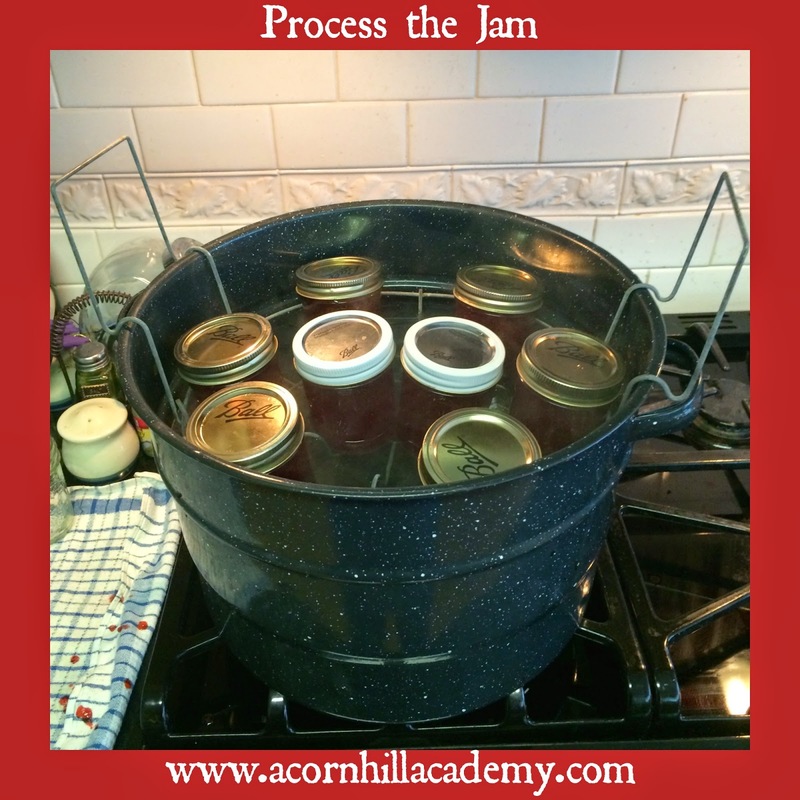 If you've never made jam, it's a bit labor-intensive, but it's not difficult. And, if your family eats jam (in spite of all the sugar-haters), it's worth it to know exactly what's in it. Many jams you can purchase at the grocery store have high-fructose corn syrup in there, which we try to avoid. I thought I'd tell you just how easy it is to make jam. 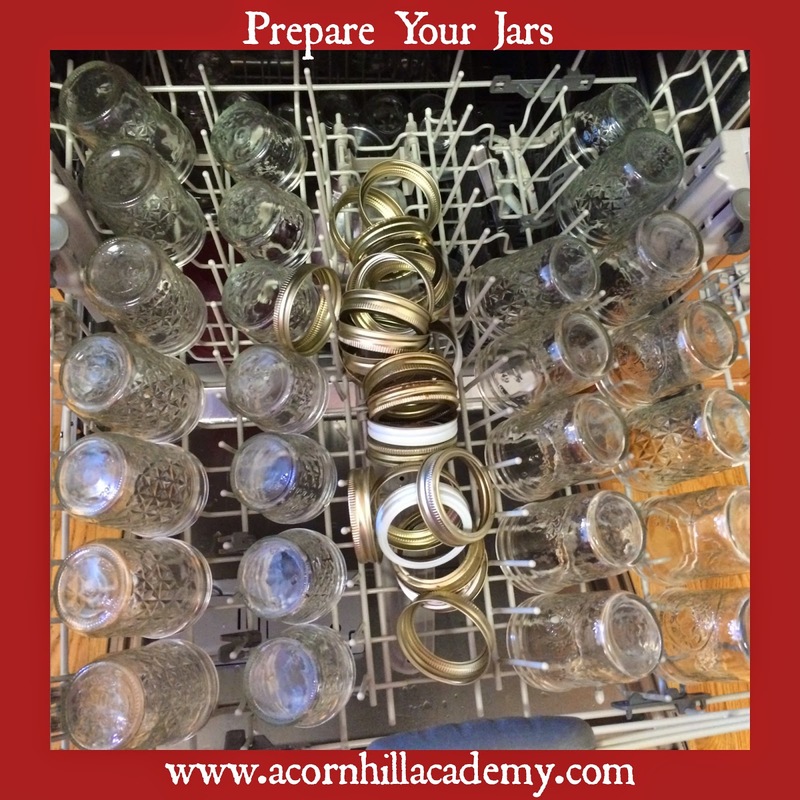 First, you have to sterilize your jars and lids. I run them through the dishwasher. My mom used to boil them, and Isaac thought that sounded like all kinds of fun. Nothing says "I LOVE SUMMER!" like heating your kitchen, when it's already hot and humid, with boiling water, am I right? We boiled one batch in the canner, but the rest went in the dishwasher. Never say I'm not a fun mom. The reason you do this first is, if you forget, you will be very sad when your cooked jam is ready to be put in jars and they're not clean. Then, you prepare the berries. First, you have to clean them. All I do is soak them in the sink with a bit of vinegar, then rinse them. (I wash all my produce in vinegar; it kills bacteria and removes pesticides.) Once they're clean, I cut off the tops and cut them into halves or quarters, depending on how big they are. After they're cleaned and cut up, you get to squish them! I like to put them through the food grinder on my mixer. I will tell you that the instructions inside the Sure Jell (one brand of pectin) say that you should mash the berries with a potato masher, one cup at a time, because "jam should have chunks of fruit." That's personal opinion, as far as I'm concerned. I have people in my house who don't care for chunks in anything, so I grind the berries. I've never had a problem getting the jam to turn out. This is me, thumbing my nose at the person who thinks jam needs chunks. My middle child loves to use the grinder, so I had a willing volunteer for this part. get your canner and lids ready. 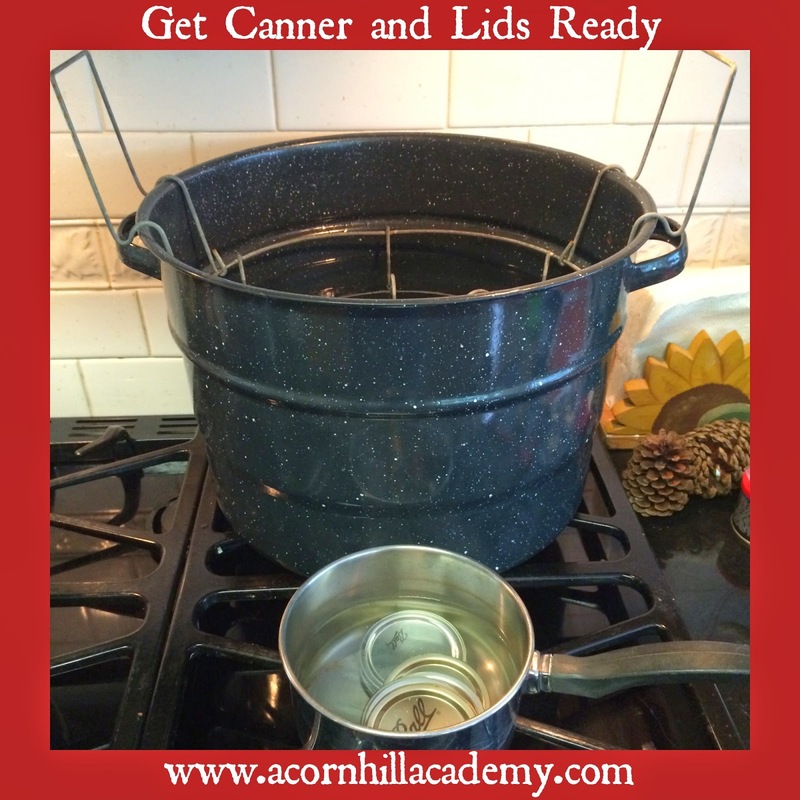 You will need enough water in the canner to cover the jars by one or two inches, and the water needs to boil to process the jam, so you want to get that started. Also, the lids for the jars are supposed to be hot, so you want to put them in a little pan with water and heat them. Once you've got the canner and lids ready to go, you can cook the berries. For this last batch, of which I took pictures, I used liquid pectin. That was a first for me. The only difference I can tell is you add liquid pectin at a different step in the process than powdered kind. First, I put the berries in the pot, then stirred in the sugar. Then, I brought the mixture to a rolling boil, and added the pectin. It had to cook for exactly one minute, then I removed the jam from the heat and put it into jars, topped them with lids and screwed on the rings. Once the jam is in jars, you put it in the canner. My canner is kind of special to me. It looks like any other canner, honestly, but my in-laws found it in the attic of the house on their family farm, and brought it to me, along with some beautiful old blue canning jars. It's the same speckled blue enamel that still comes on canners. You can see the jar lifter, which is what allows me to lower the jars into the hot water and get them back out without too much trouble. You just put them down into the water, boil them for ten minutes, and then take them out. You can listen for the lids to "pop," which is how you know they've sealed properly. All of mine sealed this time. Woo hoo! That's really all there is to it! You should get 7-8 jars of jam from a single batch. 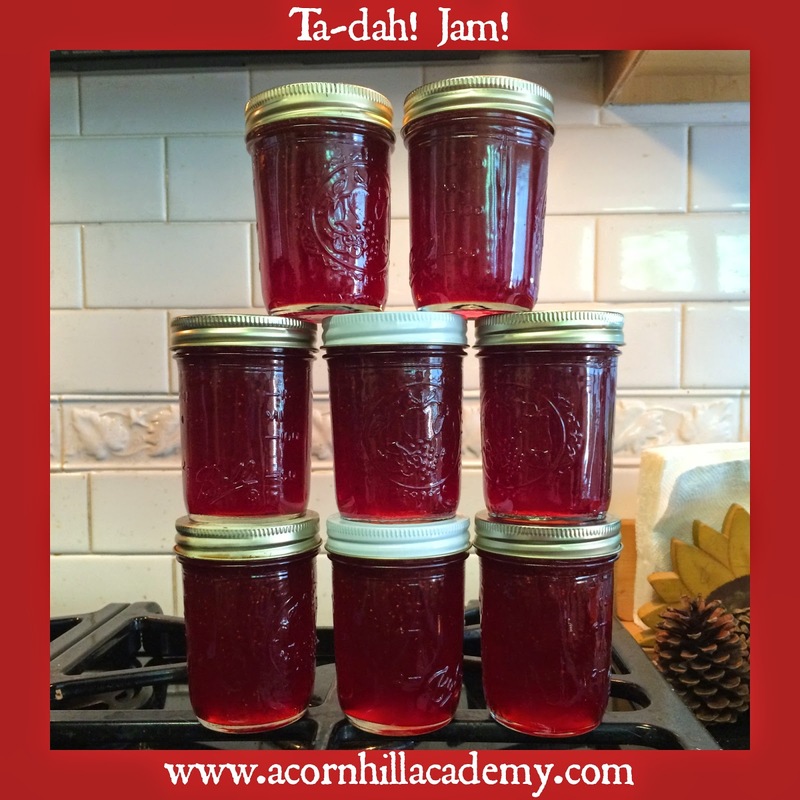 Once they're done, you, too, can make a jam pyramid! I have used both kinds of pectin, powder and liquid, and the instructions are a little different, but they both make excellent jam. With powder, you add the fruit and pectin first, bring it to a boil, and then add the sugar. 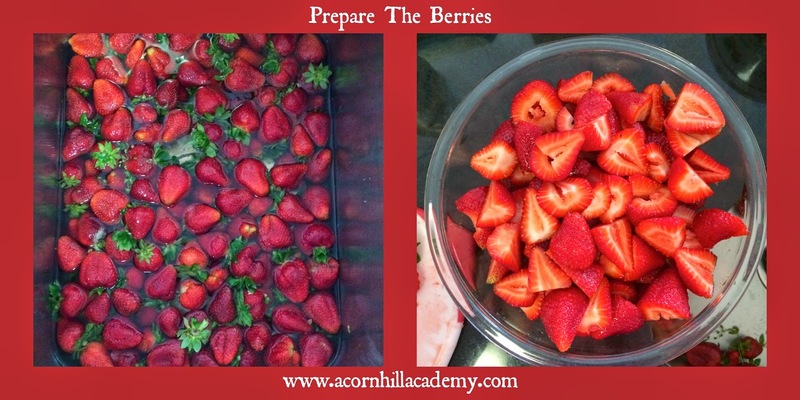 With liquid, you mix the fruit and sugar, bring it to a boil, and then add the pectin. I don't know that I have a preference between them. They're both easy. The only thing is that you need to be exact with your measurements of fruit and sugar. I'm no cook, and I frequently have to backtrack and try to fix things when I'm cooking, but I follow the directions for making jam and I've never had a problem getting it to set. This was a fun jam-making session for me. 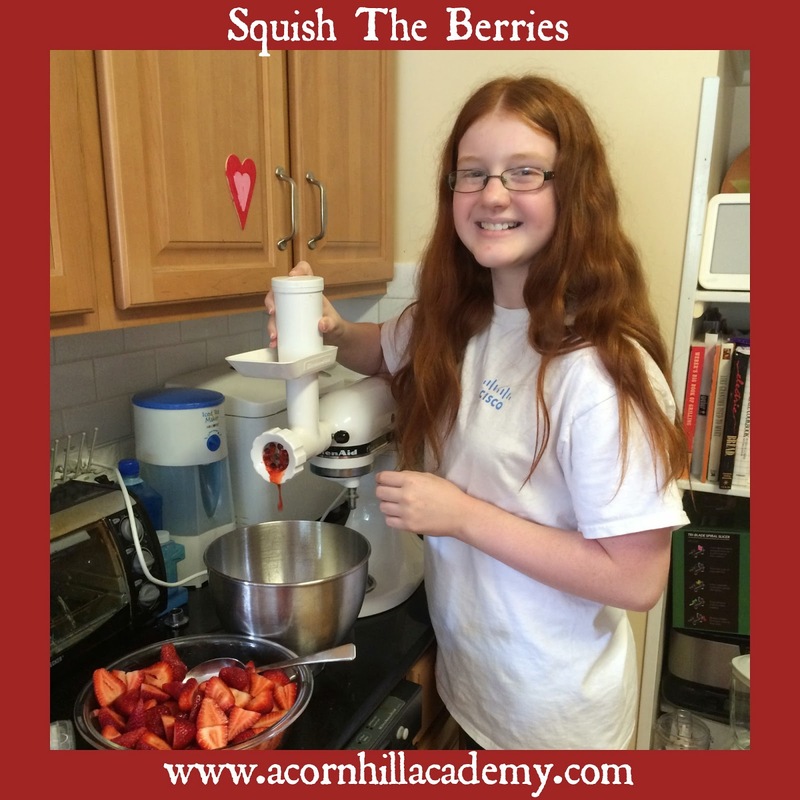 My berry-squishing volunteer was interested in making jam, so she made an entire batch all on her own. I'm so proud! I felt a little guilty that we weren't doing something related to school work, but you know, now she can make her own jam, and that's important too. She's really proud of herself, and I know she will feel a real sense of accomplishment when she sees us eating her fabulous jam. Yum! How much sugar to berry ratio do you use? Will the pectin box tell me? p.s. my latest BBP post is up and it's about headers. Do NOT change yours. It's perfect! I follow the recipe on the package. I know there are other, more special recipes out there, but the recipes on the pectin packages are easiest!